1868 Beers map of Colchester shows the original location of "Schoolhouse No. 9" at the edge of the project property. ACS delivered a series of addresses to various groups including the Archaeological Society of Connecticut, the Mayflower Society, and other civic organizations, centered on the growing controversy regarding burial archaeology. 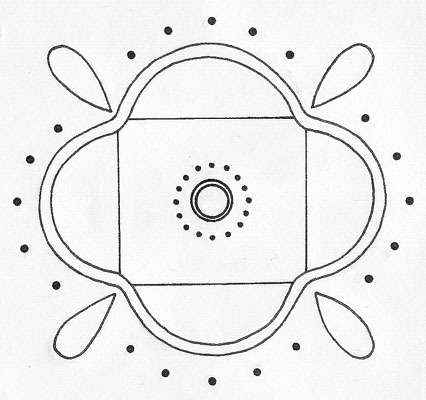 Example of a "Four-Dome" design element used in Mohegan-Pequot regalia to denote aspects of community, the four cardinal directions, and the sacred circle that unites all spiritual forces. Native American tribes typically regard disturbances to burial grounds as severe acts of desecration. 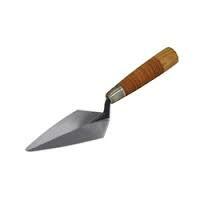 The prevailing Native American view against burial archaeology applies even in cases where excavation is conducted in a professional manner. The problem exceeds that of disrespect, for tribes consider the safe passage of the ancestors into the Spirit World to be dependent upon the preservation and care of burial grounds, and given the prevailing view that ancestors are spiritually bound with the living, any disruption to burial grounds jeopardizes the spiritual health of the living community as well. ACS conducted a Phase I survey on a property in Colchester, Connecticut to be subdivided for a housing development. The client engaged the services of ACS to fulfill requirements of the Army Corps of Engineers which requires cultural resource management surveys for projects substantially altering wetlands. ACS identified two sites on the property, including a prehistoric camp site and the remains of an old school house which were successfully incorporated into a conservation easement without hindering development. Cultural resource management involves both cultural resource conservation and articulation with the public. ACS conducts public outreach programs that provide an educational venue for the dissemination of knowledge resulting from its surveys and studies. ACS also provides recommendations and planning services for significant or potentially significant cultural resources. Planning and greater public knowledge of our cultural heritage improves the quality of life for all. Stone Pile #52 - typical stone piles at Mystic Woods in Groton consist of a dozen to several dozen smaller stones placed on large exposed boulders. Stone pile number 10 at the Mystic Woods property in Groton. A barrel hoop or other metal strap is sinuously woven into the stone pile, giving strong evidence as to the late historic origin of the stone feature. The metal is rolled and not hand-wrought, thus likely from the 19th Century or later. The lichen growth on and between the rocks is a testament to its undisturbed context. This is one of the strongest examples of proof for stone piles resulting from historic Euro-American farm field clearing efforts. Scale bar in feet. 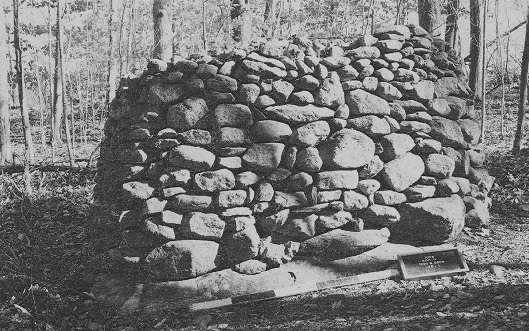 Some of the most distinctive stone piles in southern New England are located in Killingworth on Buell Hill. This is one of the largest and best constructed with respect to symmetry and quality of construction. Several of the hundreds of stone piles on the property revealing unusual craftsmanship were recommended as eligible for the National Register of Historic Places. ACS conducted an archaeological survey in the Fort Hill section of Groton, Connecticut, close to Weinshanks, one of the known fortified Pequot settlements during the Pequot War of 1637. The wooded property features 76 stone pile features, with some concerned entities indicating they could represent Native American burials. However, most piles were located on large, immovable boulders exposed above the surface, and excavations of one pile revealed a large boulder just beneath the surface. In addition, one pile contained a 19th Century barrel hoop woven through the undisturbed, lichen-bearing pile, concretely indicating its origins to the 19th Century or later. Native American artifacts and an intensive 17th-18th Century Euroamerican site were found in the vicinity of one of the two concentrated areas of stone piles near Fort Hill Brook, while neither Native American nor Euroamerican materials were associated with the other cluster of piles located closer to a moraine hill peak. 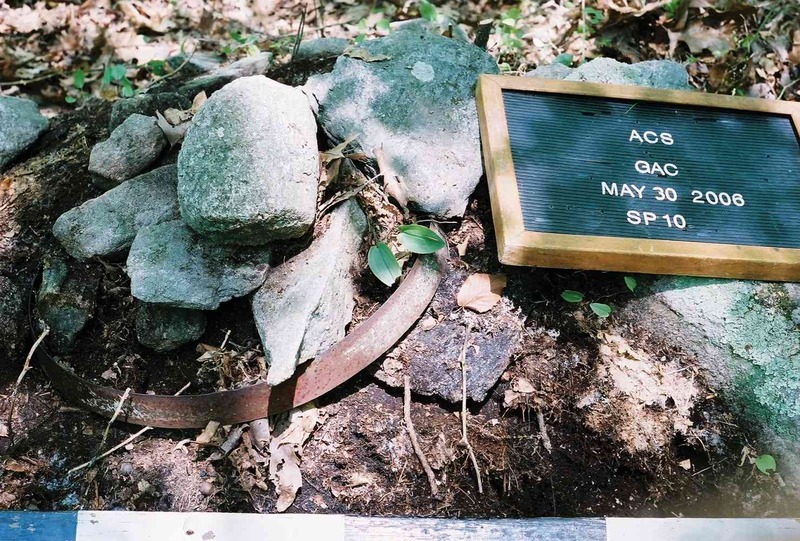 At a site in Killingworth, Connecticut, ACS recorded 381 stone features and conducted a statistical analysis of environmental variables to see if they might be related to Native American or Euroamerican origins. Because of a recurring theme of orientation of graves and origins of the Spirit Land to the southwest, ACS evaluated long-axis orientation of piles, but found no discernable pattern. Instead, the greatest consistent pattern was proximity of stone piles to stone walls on the property, thus supporting theories that they were remnants from farm field clearing activities. The attribution of stone wall alignments to delineate property boundaries or agricultural lots as Euroamerican and not ancient Native American is less controversial, as early ethnohistoric accounts describing Native American agricultural adaptations do not mention stone walls. Prehistoric rockshelters and large, solitary stone memorial heaps from the Contact period or later remain as the only documented above-ground stone features that can be positively attributable to Native American origins in southern New England. The schoolhouse site posed an interesting problem because of its location at the boundary of the property. A substantial portion of the site was located on municipal property along a road. ACS aided in the negotiation of a conservation measure with the Connecticut Historical Commission and Army Corps of Engineers which allowed the project to continue without further archaeological evaluation on the basis of a commitment by the client to cap the site and leave it unaltered as part of the larger easement. This project demonstrates the value of extensive background research, judgmental testing, and a close working relationship with the client and review agencies during the early phases of a project in order to reduce overall cost while generating a more complete picture of the past. 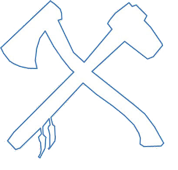 The prehistoric site was identified by the presence of quartz debitage from the manufacture of stone tools, as well as a crudely fashioned stemmed siltstone projectile point. Phase II testing involved intensive systematic subsurface shovel tests, as well as full excavation units to further evaluate the site. These tests revealed a very low density of artifacts and minimal traces of features (e.g. hearths) suggesting a very short term, task-specific site in which aboriginal inhabitants were likely targeting resources associated with nearby wetlands on an intermittent basis. Phase II testing was sufficient to document the site, and ACS was able to generate a recommendation that the site would not require further conservation efforts in the face of development. Extensive judgmental testing in the vicinity of a graphite sinew stone located at a considerable distance from the site in the plowzone revealed no further positive traces of cultural resources, and this latter area was likewise dismissed from further consideration. ACS prepared a public presentation on the analysis of stone piles at two sites in Connecticut, which relate to broader issues of interpreting physical evidence. Stone piles are controversial in southern New England because of the variability in interpretations of origin, ranging from utilitarian field clearing activities of Euroamerican farmers of the 19th Century, to ancient Native American constructions of spiritual import. Methodologically, stone piles are problematic because they do not typically contain evidence that can lead to a determination of construction date. From a cultural resource management perspective, stone piles are problematic because a misinterpretation could potentially result in either the destruction of significant cultural resources by construction or the unnecessary hindrance of development projects. The public addresses delivered by ACS are tailored to educate the public and serve to increase awareness of important issues regarding not only archaeology itself, but how this growing discipline affects our lives. This is especially important for the avocational archaeological community whose members are frequently enamored by the romantic qualities of ancient artifacts without recognizing the consequences of their procurement or their value in reconstructing behavioral patterns of past cultures. With respect to the archaeological discipline, ACS enthusiastically engages in outreach programs in order to emphasize the importance of professional research designs and scientifically based methodological approaches. Unlike other behavioral sciences, archaeologists have the unique problem that any study through excavation can only be performed once. Thus it is critical that the study of all cultural resources be subjected to high standards. Cultural resources are becoming increasingly recognized as valuable entities which deserve careful consideration and which serve to enrich our lives.